There is a striking contrast in colors in this picture of the Green River. 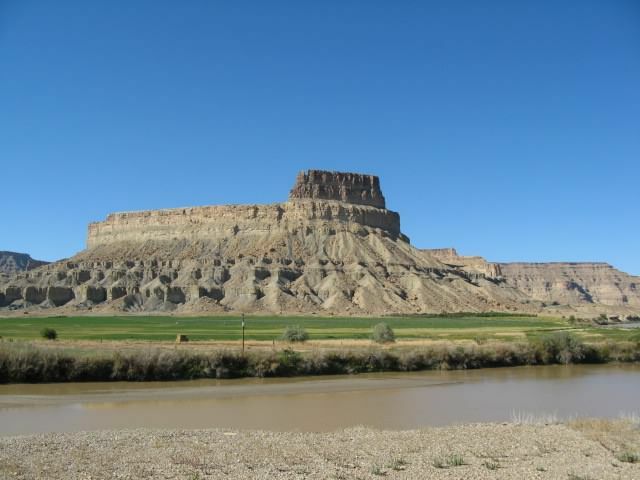 The mountain in this picture is part of the Bookcliff Mountain Range in Green River, UT. This particular mountain is Henry Mountain. It is named for my husband's grandfather, Henry Pat 'Melon' Brown. His ranch sat on the bend in the river in front of this mountain. The spot was called Willow Bend. He was the first person to try growing watermelons in Green River, UT back in the early 1900's. Green River is now famous for their watermelons. Date Uploaded: Nov. 16, 2014, 7:16 p.m.